Can the NSA lock you out of your home? According to the Magazine Spiegel, In January 2010, numerous homeowners in San Antonio, Texas, stood baffled in front of their closed garage doors. They wanted to drive to work or head off to do their grocery shopping, but their garage door openers had gone dead, leaving them stranded. No matter how many times they pressed the buttons, the doors didn’t budge. The problem primarily affected residents in the western part of the city, around Military Drive and the interstate highway known as Loop 410. Almost no communication shared by users of Apple’s iPhone is sacred or hidden from the U.S. National Security Agency (NSA), thanks to a spyware program called DROPOUTJEEP that allows the agency to intercept SMS messages, access contacts, locate, and even activate the device’s camera and microphone. Leaked documents made public by security researcher Jacob Appelbaum and Der Spiegel, a German news magazine, report that iOS devices implanted with DROPOUTJEEP have been successfully breached in 100 percent of the cases, according to a report in The Daily Dot. 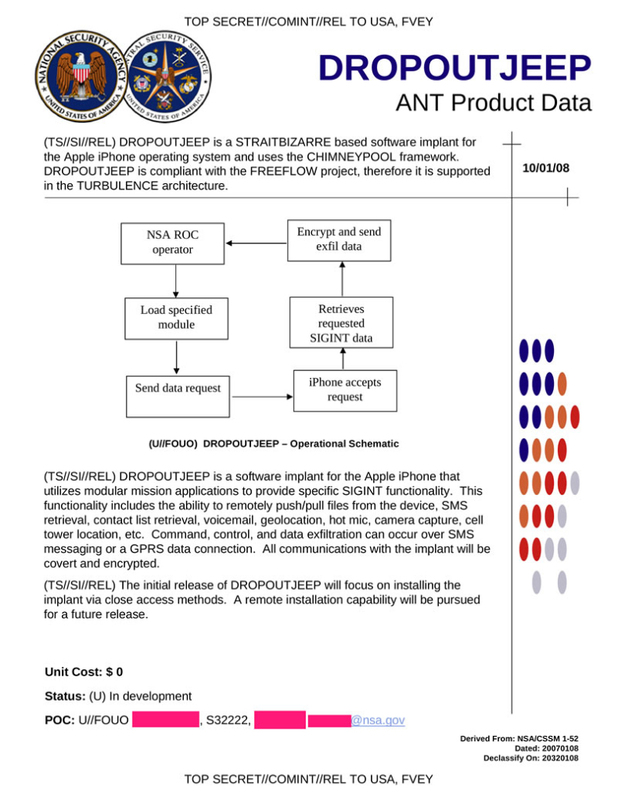 “DROPOUTJEEP is a software implant for the Apple iPhone that utilizes modular mission applications to provide specific SIGINT functionality. This functionality includes the ability to remotely push/pull files from the device, SMS retrieval, contact list retrieval, voicemail, geolocation, hot mic, camera capture, cell tower location, etc. Command, control, and data exfiltration can occur over SMS messaging or a GPRS data connection. All communications with the implant will be covert and encrypted,” noted the report. The National Security Agency (NSA) has apparently able to hack the iPhone since 2008, according to a Der Spiegel interactive report that looks at the NSA’s various tools used for spying purposes. One particularly interesting tool, codenamed “DROPOUTJEEP,” is an implant that was first used to compromise the first-generation iPhone and was able to send various data stored on the phone to the agency, including text messages, address book contacts, geolocation and voicemail. Furthermore, the software could activate the microphone of the iPhone, turn on the camera and take pictures and retrieve cell tower location. According to IBTimes, US secret services allegedly monitored the phone calls of Pope Benedict XVI, as well as those of his successor. Italian magazine Panorama claims that among the 46 million phone calls intercepted by the NSA in December 2012 and January 2013 were communications to and from the Vatican. The NSA allegedly eavesdropped on cardinals before the conclave in March 2013 to elect the new Pope, including calls between them and Cardinal Bergoglio, who became Pope Francis, succeeding Benedict. “In any case, we have no concerns about the matter,” a Vatican spokesman told IBTimes UK. According to the magazine — which is owned by former Italian prime minister Silvio Berlusconi — the calls had been classified by the NSA under four categories: “leadership intentions”; “threats to financial system”; “foreign policy objectives”; and “human rights”. In the Oval Office on May 16, 1973, Mr. Buzhardt told Nixon about his discussions with the deputy director of the National Security Agency, Louis W. Tordella, about the Huston plan. The N.S.A. conducts international electronic eavesdropping, but like the C.I.A., it is not supposed to spy on Americans at home. ”Anything the N.S.A. did is totally defensible,” Nixon said, referring to the Huston plan. Mr. Buzhardt replied: ”They move into a broader category with respect to domestic affairs” — an illegal realm.